Developed to exceed the demands of the pickiest roots musicians, the Jim Dunlop Americana Strings Series covers all your needs, from Banjo to Mandolin to Resonator guitars. 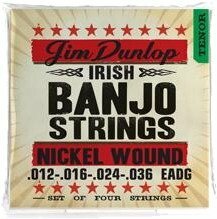 The Dunlop Banjo Set is constructed of high-grade nickel-plated steel for strings that sound crisp and punchy and are extremely durable. Our strings project loud and clear and have a smooth tactile feel.